When looking for a bartending school, you should take the time to do your research. What are the recent reviews of the school and program? ⭐⭐⭐⭐⭐’s on Google, recent and excellent reviews! Do they update their social media platforms? Instagram, Twitter and Facebook show what is going on in the classes. How often do they run classes? We have classes running 5 times a month. Where is the bartending school located, and how easy is it to get to? Only a 5 minute walk from Waterfront station. Have you gone and checked out the place? We are open 6 days a week and are glad to show you around the place. Our Instagram feed shows what the students are doing in the class this past week. We run Day, Night and Weekend classes all the time and new classes start every few weeks. We are located in Downtown Vancouver, and only a couple minutes from Waterfront Skytrain Station. Drop by and we can show you around the place during our teaching hours from 12-4PM everyday (except Friday) or 6-10PM from Monday to Thursday. 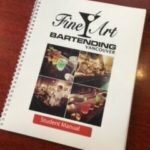 Why is Fine Art the best bartending school in Vancouver? In addition to having the best bartending course in Vancouver, our students love us! We aim to have the most comprehensive bartending program in the city, and always keep our text book and teaching methods up to date. Graduates of our bartending program can’t say enough great things about what Fine Art Bartending has introduced them to. Where else can you get a leg up on starting a new career in as little as TWO WEEKS! Founded in 1973, and locations across Canada, Fine Art Bartending is Canada’s most established and widely known bartending school. Over 25,000 graduates have spread the reputation that our Commercial Bartending Certificate is the best training offered in Canada by any bartending school. 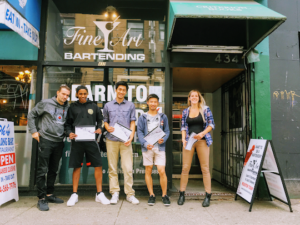 Our students have ensured that more managers and owners are familiar with the solid training offered at Fine Art than any other school in Canada. In Vancouver alone, we have seen almost 9,000 bartender trainees walk through our doors over more than 35 years now. The longest running bartending school in Vancouver by far! With the most refined bartending program, especially with all our years of teaching, we know what you need to learn. At Fine Art we don’t just give you loose sheets of paper to lose. The 100 page textbook is yours to keep. This text is regularly updated to ensure you learn to make the drinks people are now asking for, plus a few classics surely to make their way back to a happy hour nearby. Fine Art Bartending offers you the most class time of any bartending school in Vancouver. A Day or Night Class that spans 32 hours! Everything you need to know to get started behind the bar. No additional BS. If you want to learn a little more about wine, we have a class for that too! Theory is important, but learning to bartend is much like learning a sport, or learning to be a great Barista at Starbucks, or learning how to knit! More than two thirds of your time in the Commercial Bartending Course will be spent behind the bar. Not every drink is simply built on ice. Different cocktails require different mixing methods, and practice makes perfect. We have you repeat those drinks time and time again so you know what goes in each beverage and how quick that drink should be made. Your first night on the job, your new manager will notice your confidence behind the bar from all the practice time we offer. Not only that, but you will also have the knowledge to create your own fancy cocktail by the end of the classes. We are located right downtown, 2.5 blocks from the Granville and Waterfront Skytrain Stations. Where better to learn to bartend than in the heart of Vancouver’s bar and restaurant scene? It’s also the perfect spot to pop across the street and observe nearby bartenders on the job. Just find the storefront with the big “Learn to Bartend” decal on the window at 432 West Pender, between Richards and Homer. Fine Art Bartending has the most experienced instructors in the city. It seems anyone can mix drinks, but finding instructors that are knowledgeable and passionate about sharing tips on their craft is what sets any school apart from the others. Other schools might talk about having contacts to put you to work, but we know that just just isn’t enough. With any job, you need to get out there and meet the hiring managers to see if you will have chemistry with the people that work there and the environment. Sending a resume to a Craigslist post anyone can do. We point out exactly how you should be searching for that job. We have managers of restaurants, hotels, and the convention centre contact us looking for bartenders, but ultimately working behind the bar has to be driven by you. At Fine Art Bartending we ensure that by the end of our 32-hour program you will have the confidence to get out there and mix some cocktails! 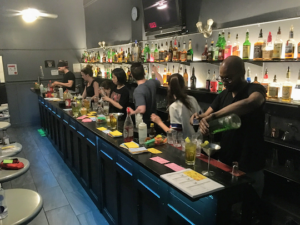 The Best Bartending School Guarantee – A Free Refresher Class, For Life! If you are not 100% confident after completing the program, or just feel you could use more practice time to get comfortable, come on back. You are welcome to repeat some, or all, of our class until you know your stuff.